I’m learning to trust my son’s literary taste in the same way I do his musical acumen. That is, at 16 he is far hipper and knowing than I have the energy to even try to be, knowing I would fail. He’s also several years past insistently recommending the latest animal fable from Brian Jacques. (A guilty father’s admission: I don’t think I could have taken many more years of toiling through the literally untranslatable renditions of ferrets speaking in what appears to be a working class Scottish brogue.) This faith in my son’s judgment was rewarded again a couple of weeks ago as we were flying out together to see my parents in Oklahoma City. He finished Point Omega on the leg from Cincinnati to Dallas, and said I really needed to read it before we got home. That the book is readable on a plane flight into flyover country says nothing about the substance, though I will say that there are times Delillo is getting away with being Delillo. Not least is the fact that he can disguise a novella as a novel with large print and widely spaced lines and still get away with charging novel prices. More importantly, I thought the first third to a half of this very short book required a lot of patience, with the reader saying, “I know this must be good; it’s Don Delillo.” The first third is filled with the exceedingly detached and ruminant monologue of a documentary film maker and his subject, an academician who has lent his talents to the government to justify a war. The book as a whole is on one level a meditation on the mystifications that led us to prosecuting the war in Iraq. He chanted the words, he intoned liturgically. He was not one of the strategists, he said unnecessarily. I knew what he was, or what he was supposed to be, a defense intellectual, without the usual credentials, and when I used the term it made him tense his jaw with a proud longing for the early weeks and months, before he began to understand that he was occupying an empty seat. This is vintage Delillo in a lot of ways, but I’m not sure this dry detachment would have born up for another fifty pages. We get it pretty quickly, the immorality of the abstracted intellectual. What makes the story go, finally, is his having to come face to face with flesh and blood loss, forced in to a recognition that he had become so abstracted from his life that he had only experienced it and those who he should have been caring about as an absence. Ultimately in novels we care first about relationships and not ideas. Or, rather, we only care about ideas to the degree that they bear the weight of relationships or corrupt relationships or get fleshed out in relationships. And so Raskolnikov, the man of ideas in Crime and Punishment, fascinates not so much because of his ideas but because he makes them flesh and blood and bone. With an axe. What makes Dickens live is not the sociological abstraction of oppressive class circumstance, but the orphaning of Little Nell. Delillo follows in that line in that what makes the novel work is not ultimately the grand ideas of the abstracted intellectual but the ways in which those grand ideas fracture man and wife, father and daughter, man from himself. That is not in itself profoundly new; if that were as far as Delillo’s book went we’d have to say it was an interesting enough take on the villany of intellectuals. We’ve had that since Faust. But as the book concludes, we recognize that the violence of abstraction is not so much a property of intellectuals as of all living in this twilight of the western world, all those of us who watch the unfolding of images on the screen of our lives, substituting the slow motion replay of dropping bombs and exploding lives for the event, experiencing that violence as an aesthetic object worthy of our repeated fascination, image abstracted from meaning, until the death of others becomes indistinguishable from other means of entertainment in an entertaining world. Delillo ultimately is a moral visionary. The darkness of his vision is not simply that he sees a world gone bad–though he indeed sees that. Rather it is that one root of that badness lies in the violence we visit on the world through our ways of looking at it. It is in the looking that we can’t escape our own complicity. This entry was posted in Uncategorized and tagged Books, Delillo, Dostoevsky, ethics, fiction, filmmaking, Iraq, literature, novels, Point Omega, politics, Reading, violence, War on August 22, 2011 by Peter Kerry Powers. I’m not much convinced that The New Yorker cover works as satire (more on that below), but I think the guys over at JibJab have another hit with this take on the political campaign. seems to suggest it does when he asserts that it’s intended, after all for “Readers-of-the-New-Yorker,” that snooty bunch. But is the meaning of the visual text here determined by the intention of the artists and the reading capabilities of an intended-and-oh-so-sophisticated-audience? In this day an age? When ANY text has no chance of being targeted exclusively at an intended audience because it will immediately be spewed endlessly into the blogosphere. What is an intended audience in such a world? I’m impressed by the degree to which the discourse has revolved around criticisms of readings and possible readings. Maureen Dowd–I liked her much more when she was being smug and condescending about Hillary Clinton–smirks that obama is prissy and humourless and should just realize that COME ON, everyone in New York knows its just a joke. This seems just like the kind of answer a New Yorker would give, believing as they do, and apparently Maureen does, that the world is their oyster. Philip Kennicott has a more interesting take on this same general idea over at the Washington Post. Agreeing with Dowd that Obama may be a bit too prissy in his response to the cover, he goes further and links it to the particular aura of printed material in comparison to our video-oriented imagination. Satire lives, but only in the bawdy possibilities of the moving image. On “Saturday Night Live,” a sketch in which Michelle Obama tossed the flag in the fireplace and Barack Obama took off the pinstripes to reveal a flowing white robe would be seen as outrageous — and funny. 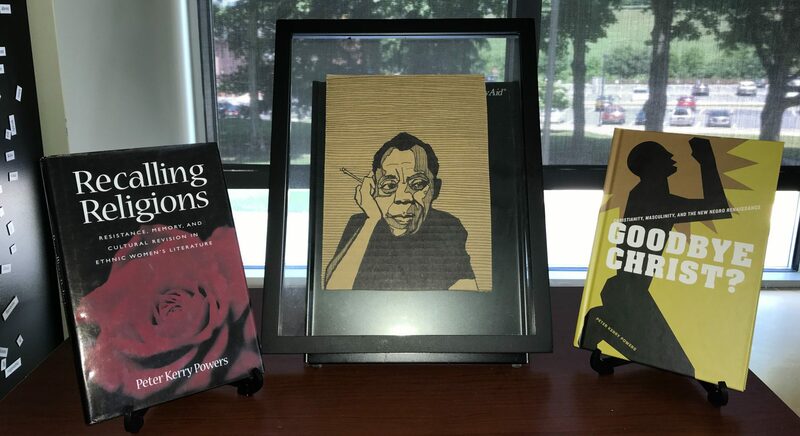 Print cartoonists, unfortunately, find themselves working in an oxygen-free environment that is increasingly akin to the atmosphere of academia, or PBS. Cable television makes print seem like something ancient and sacred, a rule-bound sanctum fraught with the ever-present risk of sacrilege. Print is becoming a strange land where the solitary reader might easily go astray. “People say, well, I get it, but I’m afraid that so-and-so is not going to get it,” said a mildly exasperated Remnick. Which is to say that even as we pride ourselves on our media sophistication, as debunkers and decoders of the visual, we fret about the power of the printed image to circulate beyond the comforting control of television’s continuous interpretation and contextualization. In the age of YouTube — where for the most part we can still laugh at each other and ourselves — we are increasingly becoming print-humor iconoclasts, terrified that someone might be worshiping images in the wrong way. I can really only go part way with him on this. Do we really think print is sacred. Just the other day in my reflections on Hard Times I was suggesting that we are so super saturated with “print”–broadly considered–that print has lost it’s aura. I think the same applies to the image. 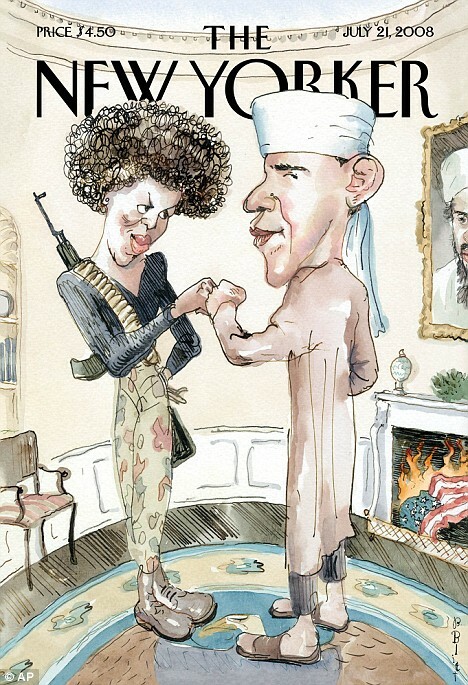 It may, of course, be that a good number of lefties have been holding Obama sacred, and The New Yorker cover doesn’t work for the same reason that jokes about Jesus mother don’t play in the Vatican. This is not a lack of irony on the part of readers, as Remnick and others have lamented. Rather, the image is not ironic at all, playing off a doubleness contained within the image or within the readers’ experience of themselves viewing the image. Instead, it is a kind of postmodern archness which is anything but ironic. Indeed, I think it’s kind of smug. On the other hand, the JibJab video really does reveal something that’s kind of true about Obama, as much as I love him. 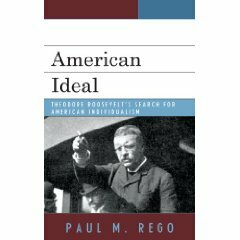 If stretched and distorted and made into a grotesque–which is what satire does, witness Swift–then you really feel the truth of the criticism that Obama is just a little too good to be true, and that too good to be trueness depends heavily on a lack of specificity that lets us project our fairy tales on to him. He will inevitable disappoint (witness Dowd’s grouchiness). In this sense, the video becomes not only about something that seems vaguely real about the Obama candidacy, it becomes about us as the viewers of the video (and more specifically as viewers of Obama). We see the truth about ourselves and our fantasies in ways that make us uncomfortable but also make us want to laugh. None of this necessarily makes me happy, about the New Yorker, I mean. I used to think that The New Yorker was the repository of all that was smart and superior and intelligent in the world. But the guys over at JibJab are way smarter. Score another one for video. Where the smart people are. This entry was posted in Uncategorized and tagged Barack Obama, Hillary Clinton, humour, JibJab, John McCain, Jonathan Swift, literary theory, Maureen Dowd, New York Times, New Yorker, Obama, politics, readers, Reading, satire, Tom Toles, washington post on July 17, 2008 by Peter Kerry Powers. Today is the anniversary of the assassination of Martin Luther King, Jr. The video is a montage surrounding the Civil Rights Movement and the life of MLK with the speech by Robert F. Kennedy playing in the background. I was in many ways too young to completely understand what was happening in 1968. But even now these words and these images move me. The words speak for themselves. Related to the general interests of this blog, they make me think of one thing very simply: Words Matter. Whether in the life and preaching of Dr. King, or the eloquence of RFK, summoned from the heart at the instant of crisis. I think I am no sentimentalist to say that I find myself longing for a leader who could quote Aeschylus by heart, who did not hold words in contempt, who knew enough to see that eloquence isn’t empty. Through words we imagine a life we can’t yet see. 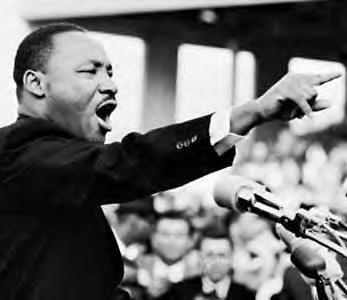 This entry was posted in Uncategorized and tagged Aeschylus, Civil Rights Movement, eloquence, language, Martin Luther King, politics, RFK, Robert F. Kennedy, words on April 4, 2008 by Peter Kerry Powers. On the Republican side, Senator John McCain of Arizona won a commanding victory over Mike Huckabee in the Wisconsin contest and led by a wide margin in Washington State. All but assured of his party’s nomination, Mr. McCain immediately went after Mr. Obama during a rally in Ohio, deriding “eloquent but empty” calls for change. Umm…I’m wondering. Why does McCain think he can make this line work any better than Hillary has made it work for the past three months? Still, McCain comes at it from a slightly different angle. If, as I suggested a couple of weeks ago, Hillary is trying to protect the legions of naive American innocents from from the seductive Black Lothario, it seems to me that McCain is invoking more directly the masculine resistance to beautiful words that has dominated white male experience in the United States for the past 150 years or so. The enduring question about John McCain is what, finally, he is willing to do to win. His favorite novel is For Whom the Bell Tolls, Hemingway’s story of an idealistic American, Robert Jordan, who goes to fight for the Loyalists in the Spanish Civil War. Jordan is willing to risk his life but never his honor, and his dying meditation, that “the world is a fine place and worth the fighting for,” gave McCain’s second memoir its title. Indeed, McCain has more than his share of doomed to duty integrity that characterized Hemingway’s public persona. The title of Hemingway’s book, of course, refers to an ultimate destiny in death and the unflinching effort of the real man to face that inevitable destiny with something like grace. A characteristic effort of Heminway’s heroes, even when they mostly fail the chance. There’s a way, of course, in which McCain clearly does live out the Hemingway mythology. The prisoner of war refusing to bend the knee to his enemies, the maverick political independent, the loyalty to Bush on principle regarding the war, even when in his heart of hearts I think McCain finds Bush despicable. Even McCain’s political story this primary seasons unfolds like that of a Hemingway hero, the man willing to do what he believes in without resources. The belief that a man should stand up and do the right thing even in the face of overwhelming odds and the inevitable odds of death. As the Times suggested a couple of days ago, he doesn’t even pander well, which is precisely what makes him attractive to so many. Even I like McCain, and I disagree with him about almost everything. Proof again that policy statements and knowing the ropes may be important things for a Senator, but it’s not so clear that this kind of political minutiae is what will get people to follow you. I say “ironic” because Donne’s meditation is primarily about the unity of mankind, “No man is an island.” We are all part and parcel of one another, involved in all mankind. Sounds positively Obamian. We are the hope we’ve been waiting for. We are the world. We are the children. Nevertheless, even if McCain runs on this Hemingwayesque idealism, he’ll give Obama a better run for his money that Clinton is right now. On the other hand, if he tries to tell the American people that they are naive for hoping that the world can be different than thepolitical world the baby boomers created …well…politicians don’t get so far telling people they are stupid. The irony of McCain is that he was, in some respects, the Obama of the last political season. If he goes against the instincts that made him a winner in the past, he’ll just be another old guy that Obama will blow out of the water. Side bar number two: Obama might well be saying, it’s morning in America. Hillary could learn more than one lesson from Ronald Reagan. Side bar number three: I’m not so sure Obama isn’t more ruthless and politically savvy than Clinton gives him credit for. He appeared on television in the middle of Clinton’s speech last night, and every station in the country dropped Hillary to hear what he had to say. Why does Clinton think Obama is so unable to handle tough as nails and ruthless Republicans? He’s shown every ability to handle tough as nails and ruthless Democrats like, umm, Bill and Hillary Clinton. This entry was posted in Uncategorized and tagged Barack Obama, Books, culture, Ernest Hemingway, Hillary Clinton, John Donne, John McCain, politics, Reading, Ronald Reagan on February 21, 2008 by Peter Kerry Powers.